Our client wanted to celebrate his birthday with friends with a truly immersive and physically challenging experience. After extensive consultation, we delivered an awe-inspiring cave trek through the world’s largest cave system, jungle exploration, and unparalleled access to heritage sites. All this with touches of luxury. This was a birthday celebration, after all. Vietnam’s abundant jungles have been hiding a remarkable secret for millions of years, a new, natural wonder. 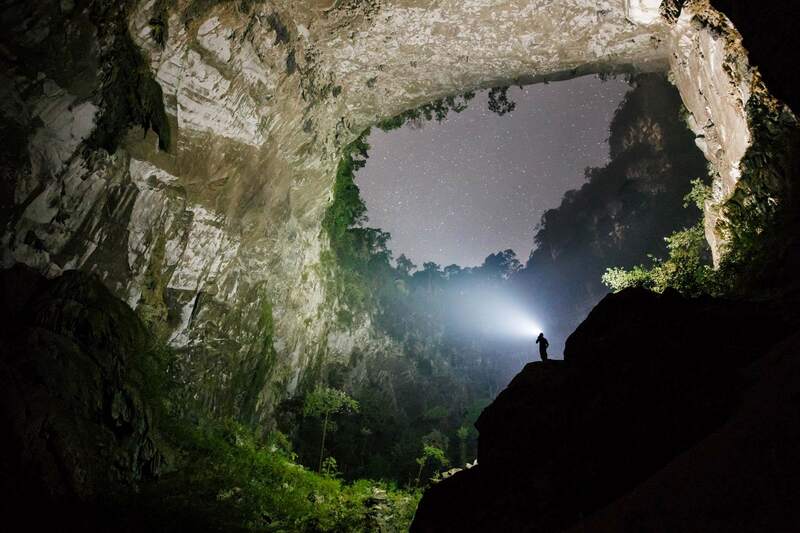 The caves of Hang En and Hang Son Doong have seen fewer visitors than the South Pole and are so vast they can accommodate a 747 passenger jet with ease. While exploring the caves was at the heart of the travel experience, a rich and varied itinerary delivered much more. Unlocked experiences – Liaising with government officials gained us exclusive access to the iconic Ha Long Bay, allowing us to fly two seaplanes into the heart of the archipelago. Behind the scenes – Unique access to the world-famous Angkor Wat complex provided quiet corners away from a million locals visiting for Khmer New Year. Action-packed adventure – Stand-up paddle boarding, kayaking, free-climbing and relaxing in closed sections of a UNESCO World Heritage Site. Avoiding the crowds – A night under the stars for supper on a jungle plateau, away from the thronging crowds of Siem Reap. Birthday surprise – A dramatically staged birthday prank of filmic proportions to thrill the group, to the delight of our client. 3540 kilometres and thousands of years of history covered. 2 jets, 2 seaplanes, 2 helicopters, and dozens of minibuses, tuk tuks, motorbikes, and mountain bikes. 3 yachts, 4 speedboats, 5 jet skis, 9 kayaks and 6 SUPs. And a small army of nearly 120 people. One unforgettable birthday celebration, all professionally recorded for an amazing photo and video album to treasure. The world is full of possibilities and unknown pleasures. Contact our expert team today and see where it takes you.